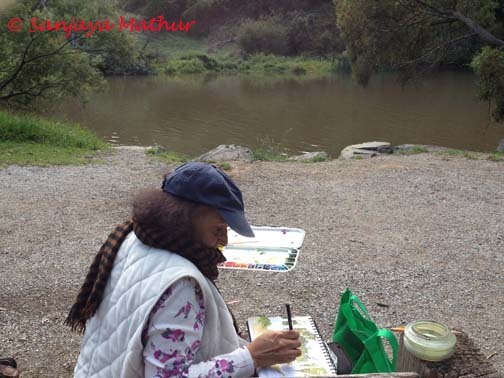 On a recent trip to Melbourne, my sister, Pushpita, and brother-in-law, Sanjaya, planned lovely plein air painting venues for me and for her. 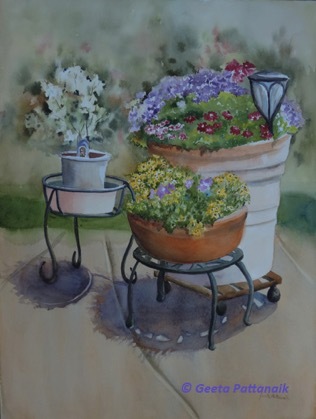 She did sketching and I did sketching or painting. This was a scene near the Yarra River at Warrendety, a very leafy area. There was a bridge with lots of tree stumps and broken branches to add to the beauty of the place. I always pack my painting things before my clothes and this small set up is good enough to complete some finished pieces. 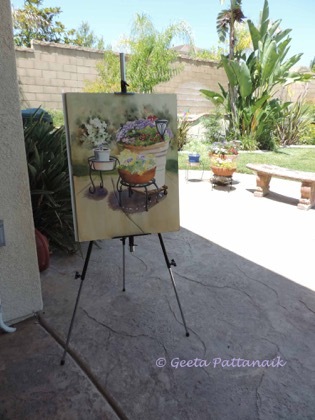 I had about an hour to pick a suitable view, find a seat and get a small painting done, while talking with the lovely passers by, and be congratulated by a group of 14-15 year olds for my painting (one of them giving me gentle pats on my shoulder for the work I was doing). One merges into the spirit of the place when one observes all the details of the scene, the smells, the sights and the sounds and how they fit into each other to form the unique place. I always remember and acknowledge J. Krishnamurthy, the world renowned philosopher, for his encouragement to actually open one's eyes and not just "see" in a passive way. I am grateful to have had the opportunity to see and do some unique things in this gracious city, thanks to Sanjaya and Pushpita, who found out what we wanted to do and made it possible, and not just take us to the usual spots tourists see. My mind and my camera are still brimming with the images from this memorable trip my daughter and I took to mainland Australia and the extended trip to Tasmania. It is one of the most memorable trips I have ever been on.